104 Avenue will continue to be closed overnight Monday to Friday and on occasional weekends until the construction of Rogers Place is done in fall 2016. Please detour using Jasper Avenue or 107 Avenue. The closures are necessary to allow for the safe installation of the Winter Garden pedway over 104 Avenue, with minimal disruption to traffic. The City has issued a noise bylaw relaxation to PCL Construction to allow crews to work beyond the standard time regulations. The January 8, 2016 Construction Bulletin details the road closures and area traffic movements. 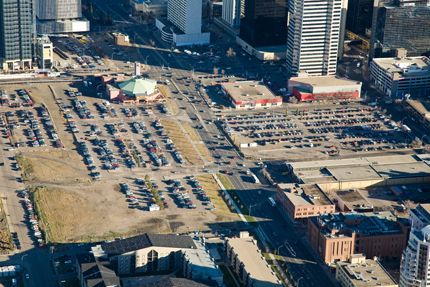 The construction of Rogers Place started at a brisk pace and continues to move rapidly. The steel beam and exterior structure is now completed. Crews have now begun the exterior finishing work, including the stainless steel tiles that will give Rogers Place its iconic finish that resembles snow drifts. Much of the work is now focused within the building, with drywall and preparation of the future ice surface underway. February 28, 2014 Construction Bulletin: Excavation starts on site. July 29, 2013 Construction Bulletin: Pile testing on site, completed mid-October 2013.